What's So Special About the Frigidaire FFFU14F2QW? Let's be real, average size freezers are too small, and sometimes we need to buy a bigger one. That's where the Frigidaire FFFU14F2QW model comes in. This upright freezer is perfect if you need extra room. If you buy one, you will no longer have to worry about your primary freezer being so filled with popsicles and frozen pizzas there is no room for meat during the summer when your kids are home. You'll also never again have to pass up those great deals in the supermarket because your freezer is too small. Honestly, buying an upright freezer is one of the best decisions you will make for your household. If you have decided you are sick and tired of sacrificing your chicken for your ice cream and are in the market for an upright freezer, the Frigidaire FFFU14F2QW is one of the best. The freezer has stellar ratings on every site that it is sold on. For instance, on Home Depot's website, the freezer has 4.5 out of 5-stars. One customer who calls himself Coopster said,"This freezer, in particular, stays very cold (deep freeze) and has not developed any frost in the month that I've had it." At Lowes, the freezer also has a 4.5 out of 5-star rating. A Lowes customer going by the name of Salor72 exclaimed,"Good design interior, seals tight and really keeps food frozen 'rock hard.'" There are hundreds of more reviews just like those on both of the stores' websites. The Frigidaire FFFU14F2QW allows you to store all of your frozen food and never worry about the freezer frosting up. The freezer has a frost-free feature, and the manufacturer claims you will never have to defrost your freezer again. Additionally, the Frigidaire has 13.83 cubic feet of storage space. It also comes with the SpaceWise organization system that includes a variety of bins and racks to help keep your food neat. The system even comes with a LED theatre light that helps you see so you won't have to dig through the freezer looking for things. 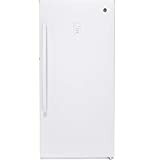 The Frigidaire upright freezer has adjustable temperature controls, a safety lock with a pop-out key and dial control. The freezer is also 24 percent more energy efficient than the company's 2013 models. How Does the Frigidaire FFFU14F2QW Compare to Other Brands? Some brands are comparable to the Frigidaire FFFU14F2QW. 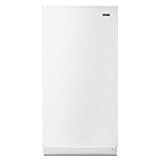 The Maytag MZF34X16DW, Danby DUF138E1WDD, and GE FUF14DLRWW are the three most closely related to it in both size, function, and price. The Maytag is an upright freezer as well, but it is a little bit larger than the Frigidaire. Instead of 13.83 cubic feet of storage, the Maytag has 15.7 cubic feet of storage. The freezer also has a reversible swing door, three adjustable shelves, and five full-width door shelves. Just like the Frigidaire, this freezer has a setting that prevents it from collecting frost. The interior has easy to use temperature controls, holds approximately 16 bags of groceries, and has LED lights. It also comes with a 1-year limited warranty as well as a 10-year limited parts warranty on the compressor. The GE upright, frost-free freezer is an incredible freezer. First of all, GE Appliances is one of the most trustworthy brands in the United States and you know when you buy something from them you are getting a quality product. This freezer is Energy Star rated, has interior LED lighting, and a door lock with a key. The temperature control is on the outside of the freezer, and they are very easy to use. The GE freezer has slightly more storage space than the Frigidaire, 14.1 cubic feet. Also, like the Frigidaire it has a frost-free setting, and the manufacturer guarantees that you will never have to defrost it. The freezer also has great storage with two clear drawers and two adjustable shelves. The Danby Upright freezer is a lot like the Frigidaire FFFU14F2QW. It has 13.8 cubic feet of storage and a frost-free feature that prevents ice build up. It is Energy Star rated, has easy to use temperature adjustment controls, and has a quick freeze function. The Danby freezer comes with a really cool door alarm that alerts you if you have left the door open and a high-temperature alarm that will tell you if it's not cold enough. The freezer has a sturdy storage basket, four interior shelves, and door shelves. The Danby also has an interior light and a right-hand door swing. The refrigerator also comes with an 18 months parts and labor warranty. The Frigidaire freezer has pros and cons that you should know about. We discussed the pros of the product specifications section above, but there are some cons too. There have been some complaints that the freezer is too loud. People have complained that even when it is in their garages, they can hear it inside of their houses. A woman who calls herself Bluebird52 on HomeDepot.com said,"I am shocked at the amount of noise it makes as the compressor turns on and off 3 to 4 times every hour." Another customer, BJ, said,"This is the noisiest freezer I have ever heard. The freezer is located in my garage, but the "hum" of the motor is heard throughout my entire home." That was really the biggest complaint about the freezer. So, if you can handle something that is a little bit noisy, this may be the freezer for you. The Frigidaire FFFU14F2QW is a pretty great upright freezer if you are in the market for one. It has a decent storage capacity, nice shelves, and really good reviews. Our only concern is that its compressor creates loud noise. There are other comparable freezers, but the Frigidaire is the least expensive and offers almost all of the same things. It's definitely worth considering if you need a new freezer. Overall we are giving a rating of 3.9 stars out of 5 stars.